Marking four decades since they unleashed their debut album, the New Wave of British Heavy Metal the band will play a trio of shows in iconic venues featuring their fabled castle stage set in its enormity together with the classic Eagle Lighting rig. 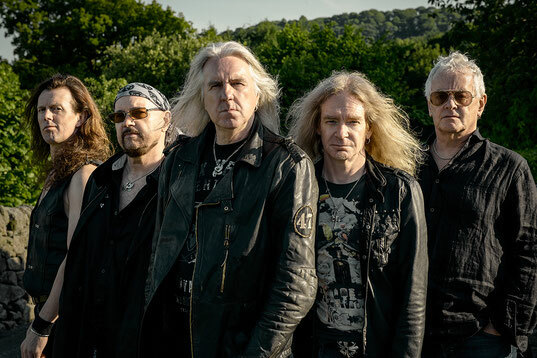 Friday 18th October, Saxon will play their biggest Scottish show of their 40-year career at Glasgow’s Braehead Arena where they will be joined by special guest Black Star Riders together with Girlschool who are opening the show. Saxon will then play London Eventim Apollo Hammersmith on Saturday 19th October and Manchester Apollo on Sunday 20th October. Fans who pre-order the album from the Official Website before 8am Friday 25th January will receive Exclusive UK Tour Ticket Pre-Sale Access with all copies of the album including an exclusive replica of the band’s Donington Monsters Of Rock 1982 set list hand signed by Biff Byford – ready to frame & display.